British trade delegates and founders of Mitra Innovation – Dammika Ganegama, Managing Director of Mitra Innovation and Vice President Sri Lanka Australia Chamber of Commerce, and Dr. Ashok Suppiah, CEO Mitra Innovation and ex-founding member of $ 1 b Virtusa Corp – met with leaders of the Vietnam Chamber of Commerce and Industry – Nguyen Van Hai, Deputy Director General International Relations Department VCCI, and Dr. Doan Duy Khuong, Vice Executive President of the VCCI. 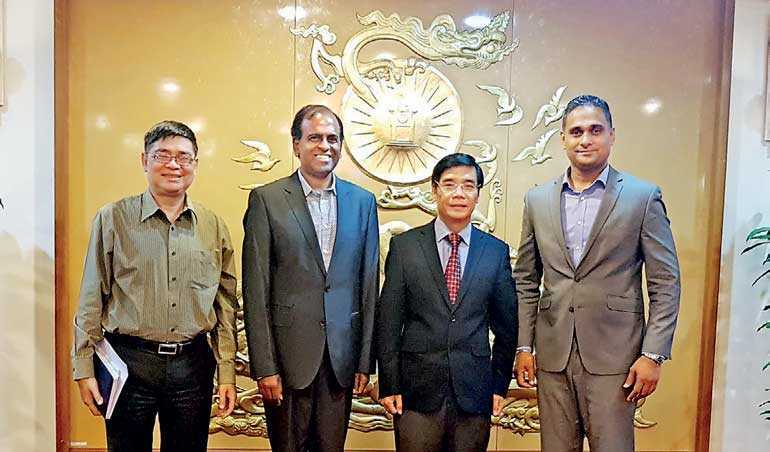 Mitra Innovation founders and VCCI leaders discussed alliances between the VCCI and Mitra Innovation in the development and delivery of modern day computing technology – to assist in the upliftment of urban and rural agriculture. The novel technology concept – termed AgriTech – is aimed at employing invaluable cloud computing, internet of things, data lakes and predictive analytics to deliver real value for farmers in the management of crops, overall food security of the nation and increase crop yield. Vietnam is one the fastest growing economies in the world today. With the South China Sea to its western and south western borders, Vietnam enjoys friendly relations with neighbouring Laos, Cambodia and China. Vietnam is home to over nearly 97 million people and boasts a steady 7% GDP growth rate over the past few years. The VCCI also expressed their intentions to invest in education, infrastructure and welfare and were seeking assistance in technologies relating to farming and agriculture. Both parties talked about implementing advanced modern technologies for the further improvement of Vietnam’s agricultural industries. Vietnam is considered one of the most picturesque countries and is considered a highly fertile land source for crops such as rice, corn, cassava, sweet potatoes, nuts, banana, coconut, citrus, coffee, tea, rubber and a variety of fruit produce such as banana, orange, mango, jackfruit too are easily found on the tropical nation. Vietnamese farmers also cultivate arca palms, betel peppers and mulberry bushes – for the production of silk. Vietnam exports produce of the rich seas that borders the nation. Major seafood exports are shrimp, squid, crab and lobster. There are also a number of freshwater fisheries and commercial shrimp farms to Vietnam’s advantage.